It’s that time of year up here in Northwestern PA it’s seed starting time for our summer gardens. Yes, it is officially time to get those seeds into their growing trays so our plants are the right size come Memorial Day. This is just about when we put our plants out into our gardens. Now, if you have not yet tried your hand at starting tomato plants from seed don’t be afraid it’s really quite simple. Where I live a flat of tomato plants can cost around $18. Whereas a packet of good seeds cost about $3 and the organic seed mix is usually under $5. Two packs of seeds and a bag of dirt will give you about 2 flats of plants if not more. So you can see right off that growing your own plants is a cost saver of about $28.00. Just another reason why you should give this a try! Before we dive in there are a few things you will need to have first. 1. You will need a place to grow your plants. Some place that is preferably warm (although it’s not a requirement) and out of the way of tiny hands and nosey pets. 2. You will want a stand of sorts to hold your flats of delicate plants. Sure you can purchase stands and pretty elaborate growing systems. But I like to do things on the cheap. We had an old shelving unit that had seen better days but I knew would be perfect to use as a seed starting set up. Step #1 Gather your containers. You know those plant containers your plants come in? Well, never EVER throw those out. They are more durable than you think and perfect to use when started your new batch of seedlings. I believe I am on my 8th year with these containers and they are still holding strong. I also have the trays the plants came in which are really convenient when you are moving from inside to outside. They are also great for keeping water from dripping all over your floor. Step #2 Start with a good soil mix. 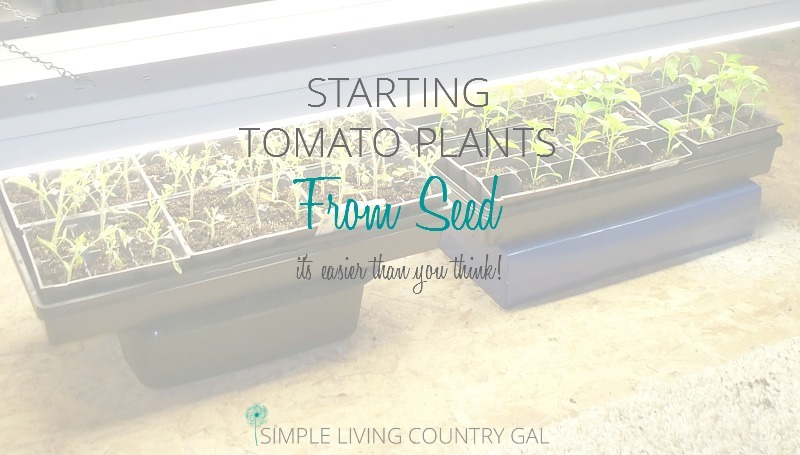 When starting tomato plants from seed the key is a good starter soil. 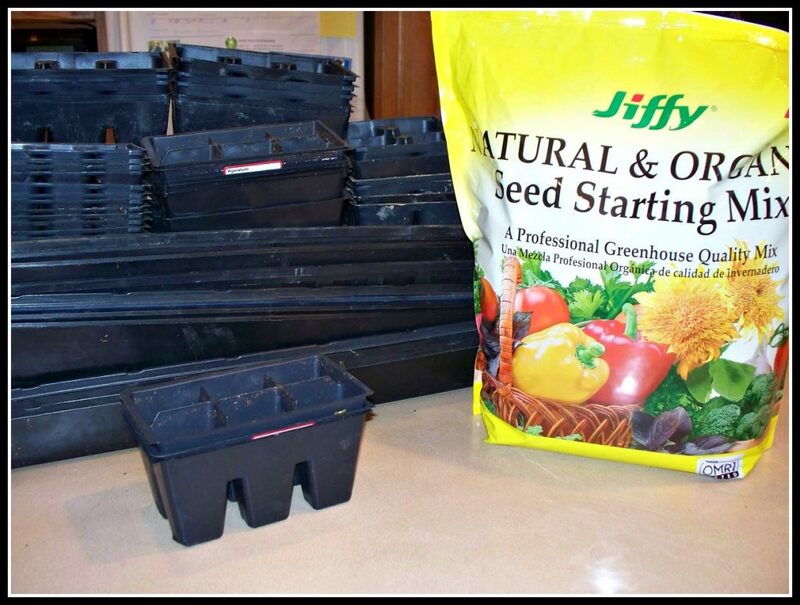 I prefer to use organic seed starting mix, although I have used others with good success. I just like the quality of this mix and have had great luck with it. It is surprisingly inexpensive and sold just about everywhere both online and in stores. Step #3 Clean and sanitize. 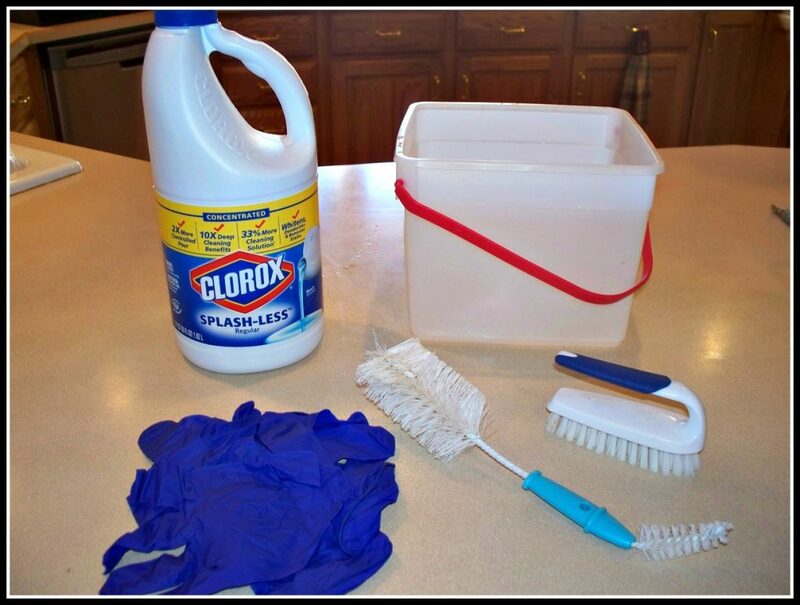 If you choose to reuse planters you already have you will want to wash and sterilize them. I like to use a bottle brush (bought from the dollar store) and some soapy water with bleach. Wash each one, rinse well, and stack on a large towel to air dry. Step #4 Prepare your soil. One of the best tips I can pass on to you is to make sure you presoak your starter mix. I have tried to plant my seeds without presoaking and they took forever to sprout. The mix holds in moisture giving your seeds a the perfect foundation for growth. To soak your soil you will need a large container like this wash tub I found again at the dollar store. Pour in some mix and add a generous amount of water. Next, take a large spoon and work that water into the mix. Continue doing this until the soil is thoroughly damp yet not soaked. If you get it too wet you will want to let your soil sit for a day or two. Step #5 Plant your seeds. When planting your seeds please be sure to follow the instructions on your seed packets. I always put 2 seeds in per pot to ensure the growth of at least one plant. If both seeds take, you will need to pull one out later on so that all the water and nutrients in the soil will be focused on just one plant. The trick is to grow the strongest and healthiest plants so that you will have an amazing harvest come summer. Step #6 Set up a growing system. The great news about setting up a growing system is anything at all will work! 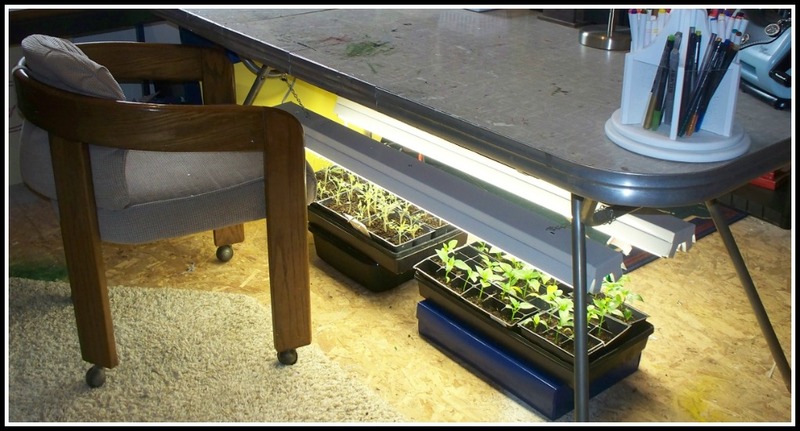 When I first began growing my own seeds I used a table in my craft room. I placed my flats under the table so they were out of the way and suspended my lights from lightweight chains attach below. The lights I use are 4 foot long and are the perfect size for a flat of plants. Since this area of the home was relatively warm the lights gave off enough heat. This set up worked surprisingly well and I used it that way for 4 years with much success. I have since moved to a larger system in my chilly basement and therefore needed to add a cover to keep the heat in. Just a sheet of pastic used as a drop cloth for painting. This inexpensive plastic turned my shelving unit into a greenhouse of sorts and kept a constant temp of 68-70 degrees even in our cold basement. The first few days you will not need to water since you already dampened your soil. When you do begin to water I suggest using a disposable water bottle. I find I can control the amount of water much better and there is less risk of drowning my plants. 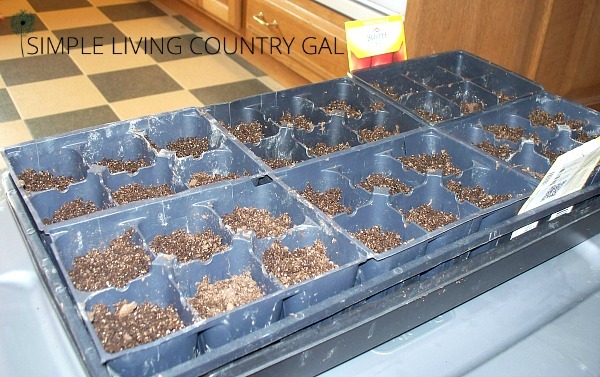 You will want to gently water your seeds giving just enough without saturating them. Once the young plants have sprouted you can then switch to the spray bottle. This will water your delicate seedlings without crushing them. It is so important not to over water in the beginning. If the soil is wet, do not water. Depending on the type of seeds you plant you should see something at about 6-8 weeks. If after 10 or 12 weeks you still see nothing then I would assume the seed did not take. Please refer to your seed packet to verify you have given your seeds enough time to sprout. Step #7 Add more soil. You may notice after the first few days the seed mix begins to settle a bit. At this point, you will want to add a little more soil. Remember to make sure it is also dampened up. Just use your hands and put more soil as needed. Step #8 Thin your seedlings. This is always the hardest part for me. Remember in step 5 I told you to put 2 seeds into each planter? Well if you notice that you have 2 or even 3 sprouts you will need to remove all but one. Choose the strongest seedling to keep and gently remove the extras. The best way to do this is to put your finger on the soil to hold the desired seedling in place as you pull the extras out. Ninja tip: If you had seeds that did not sprout and now find you have empty seed containers you can try to transplant the removed seedlings there. They may not take but I have found more often then not they do! Step #9 Hardening up your plants. As it gets closer to planting time, see here for dates in your area, you will want to begin hardening off your plants. That just means getting them acclimated to the weather. This is especially important if you live in a cooler climate as I do. Take your planters outside on a sunny and preferably windless day and let them soak up the rays of the sun. Start out slow and increase the time as you go on. This will strengthen your seedlings and better prepare them for the cooler evenings. If you don’t have a garden, don’t worry! You can grow all you need right on your front porch! Read: How to Grow Tomatoes in Pots – A Step by Step Guide. Starting tomato plants from seeds is not only economical but easy and fun as well. I just marvel each summer as we enjoy those beautiful tomatoes that all started from a tiny little seed. Try your hand at it this year so you too can enjoy the fruits of your labors come summer. Great post! I’m usually starting seeds as well but we’re anticipating a move so I’m not going to be starting any. thank you for sharing your post on Our Simple Homestead Hop, as one of the co-hots I will be featuring your post tomorrow! Look forward to what you’ll be sharing this week! 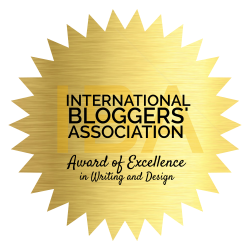 I am so happy you enjoyed it and that it will be featured. You just made my day! MY TOMATO SEEDS HAVE SPROUTED AND LOOK YELLOW AND THEY WON’T GROW ANYMORE, WHAT’S WRONG? Yellow plants could be a few things. Too much water for one. 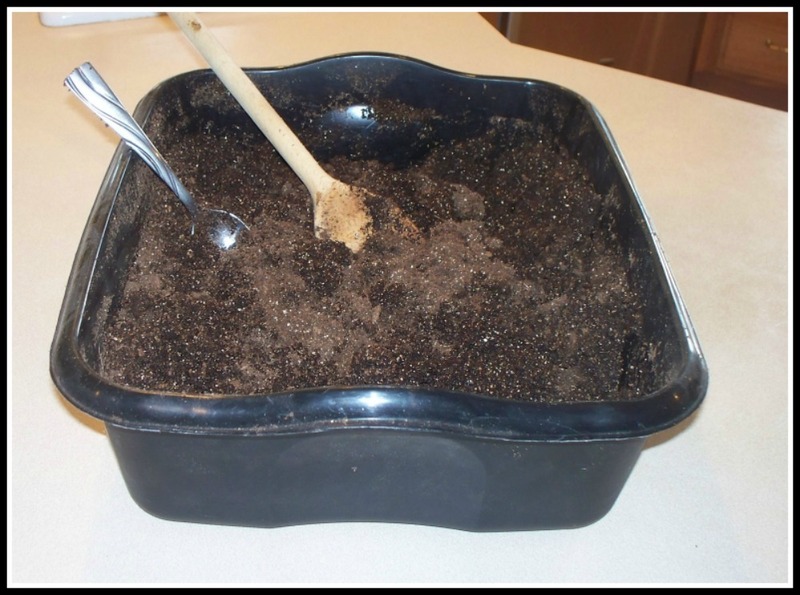 Make sure the soil is moist but not soaked. Another is not enough light. If you have your plants under grow lights, maybe raise them up by stacking a few books underneath. Those two things should fix them for you!